The National Marine Fisheries Service (NMFS) missed a mid-July deadline regarding the listing of the Banggai cardinalfish [Pterapogon kauderni] under the Endangered Species List (ESA). Today a NMFS spokesperson confirmed the Service is still evaluating whether or not listing the species as endangered or threatened is warranted. The now passed mid-July 2014 deadline was the result of a “positive 90-day finding” published in the Federal Register in late February 2014. In that publication, NMFS announced there was “substantial information” in a July 2013 petition* to list the Banggai cardinalfish. By statute, after a positive 90-day finding, NMFS “must conclude the review” of the species in question within 12 months of the date the petition was originally submitted. In March, I interviewed Therese Conant, the NMFS Endangered Species Conservation Division biologist charged with the Banggai cardinalfish status review. She acknowledged at that time that the status review was a huge task and one that may be difficult to complete by the deadline. “As long as we’re showing reasonable progress,” she told me in a phone interview, “I’m hoping that that will suffice.” She explained that NMFS is very vulnerable if the petitioner decides the Service is “dragging its feet.” In addition to the Banggai cardinalfish status review, Conant is also responsible for the undulate ray status review. The undulate ray is another species included in the WildEarth Guardians petition. At this point, it is expected that NMFS will release the 12-month findings in batches between now and the end of the year, with the first findings published within a month. The 12-month status review is an in-depth review which will determine whether or not the petitioned action is warranted. If it is determined that the petition to list the species is warranted, the Service would then publish a proposed rule followed by a 60-day comment period and possible hearings. Within a year, the proposed rule would either become a final rule or be withdrawn. 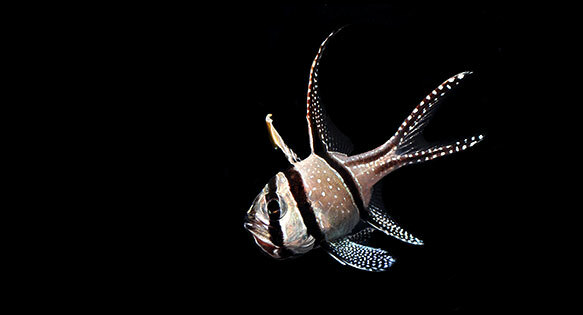 The Banggai cardinalfish is both a popular marine aquarium fish and the reef fish with the smallest known endemic range. Because of these two facts, overfishing, increased development and other anthropogenic stressors in Indonesia’s Banggai Islands have led to concerns about the survival of the species in its endemic range. Previous efforts to protect the fish in the Banggai Islands have largely failed. In part the failure is the result of lack of education and insufficient resources for enforcement of existing laws, but it is also because the species has been introduced to other parts of Indonesia where, in some cases, it appears to be thriving. In addition, a large commercial source of aquacultured Banggai cardinalfish has recently become available and has proven capable of meeting 100 percent of market demand further lessening fishing pressure on wild fish. For those of you who are not familiar with my Banggai cardinalfish work, I have been reporting on the species since 2009. In 2012, I travelled to the remote Banggai islands as the embedded journalist with a scientific team studying the species. My experiences were published in the 2013 book titled Banggai Cardinalfish. *The petition to list the Banggai cardinalfish submitted by WildEarth Guardians included a total of 81 marine species (23 species of coral, 22 sharks, 15 bony fishes, 10 skates and rays, five marine mammals, three species of hagfishes, and three species of sea snakes). In addition to the Banggai cardinalfish, 26 other species from the petition have now entered status review based on a “substantial” finding. For more information, please see my March 2014 feature for CORAL Magazine, which is available online for free at the Reef to Rainforest website. This article first appeared on the Good Catch Blog, August 6, 2014, and is reproduced with permission. Where is the large supply of aquacultured fish coming from and how can we make sure to support that sector? There are two large scale commercial producers in Asia (that I personally know of). Requesting captive-bred Banggais from your suppliers / shops is a good way. Dealing with reputable vendors who you can trust to give you truly captive-bred Banggais vs. relabeling wild caught ones is a better way. These fish are available through many supply chains now and the prices are very low at this time (compared to years past).